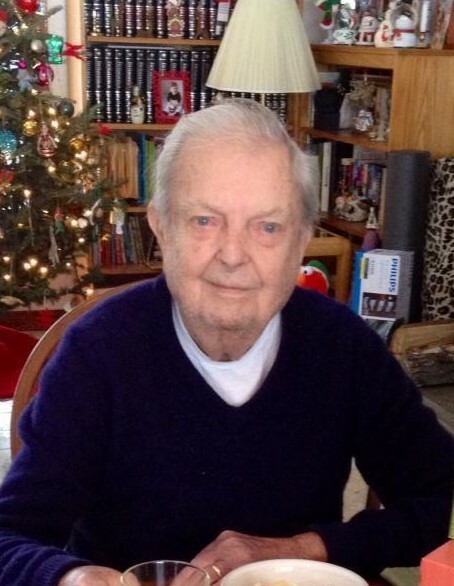 MACDOEL, CA – Edgar Andrew Davis, 92, of Macdoel, CA, died on Monday, July 9, 2018. Preceded in death by his wife of 64 years, Betty E. Davis and his son Stephen W. Davis of Marseilles, IL. Edgar was born on January, 3, 1926 in Waterbury, CT, son of the late Leslie and Lousia Davis of Waterbury, CT. He was a former resident of Morris, CT for over 30 Years. He also lived in Stuart, FL for 15 years and then moved to live with his daughter and son-in-law in Macdoel, CA. He served in the Navy on the naval ship U.S.S. Pine Island during WWII as a Yeoman 3rd Class from January 1944 to July 1946. He worked for the Southern N.E. Telephone as a Central Office Forman for 36 years, then retired in 1985. He was an avid golfer. After retirement with his wife Betty, they traveled all around the world. He is survived by two daughters, Holly (Leonard) Hughes of Macdoel, CA, and Wendy (Robert) Merli of Harwinton, CT. One son Alan (Becky) Davis of Torrington, CT. Nine grandchildren, five great-grandchildren and several nieces and nephews. There will be one hour of calling hours on August 11, 2018 at 10:00 AM at the Munson-Lovetere Funeral Home, 2 School St Woodbury, CT. Burial will follow at South Cemetery, Main St South Woodbury, CT.